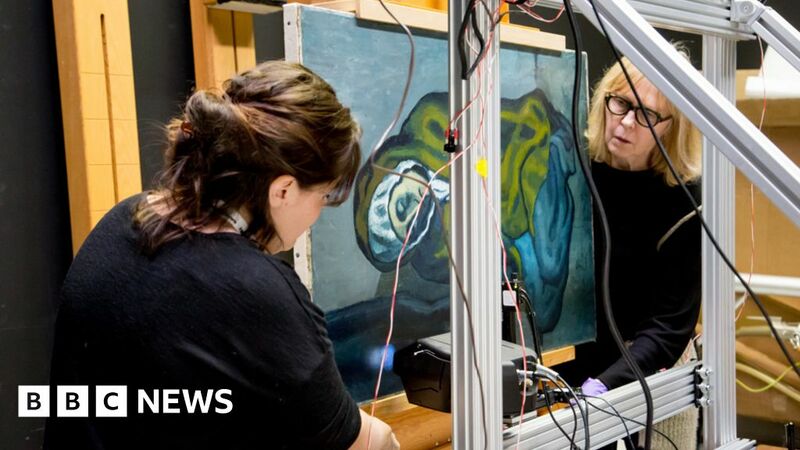 Researchers in the US have used a new scanning technique to discover a painting underneath one of Pablo Picasso’s great works of art, the Crouching Woman (La Misereuse Accroupie). Underneath the oil painting is a landscape of Barcelona which, it turns out, Picasso used as the basis of his masterpiece. The new x-ray fluorescence system is cheaper than alternative art scanning systems – and it is portable, making it available to any gallery that wants it. Details were revealed at the American Association for the Advancement for Science in Austin, Texas. The Crouching Woman is a painting from Picasso’s blue period. Media captionHow the figure of the crouching woman takes on the landscape painting beneath. What is remarkable is that the landscape painting beneath – probably by a student artist – is turned 90 degrees. The contour of the hills in the background becomes the crouching woman’s back. She takes on the shape and form of the Catalan countryside. Kenneth Brummel, a curator at the Art Gallery of Ontario in Toronto, said that he was “excited” when he first learned what lay underneath the Crouching Woman. “It helps to date the painting and it also helps to determine where the painting was made,” he told BBC News. Picasso is known to have painted over a number of his blue period paintings and Mr Brummel said he was pleased to see that the Crouching Woman was like these others. The scanning equipment is much cheaper than current scanners and it is portable, so it’s affordable and available to every gallery that wants it. Francesca Casadio from the Centre for Scientific Studies in the Arts in Chicago, who is among those leading the project, hopes that the widespread use of their scanners will increase our understanding of artists, their thought processes and the way they worked. “Many more paintings are waiting to tell their secrets and with our scanning system we can help them talk to us more,” she told BBC News. Until now scanning was only for the greatest of great works of art – and for the wealthiest galleries. Now, the new system can be used by anyone to find the story behind any painting they are interested in.